Everyone who carries a defensive handgun needs professional training. You wouldn’t buy an airplane and expect to be able to fly it without training. Nor would the fact that you own a piano make you a great musician. We need training to teach us how to do things well and to do things right. In addition, professional training creates a lot of shortcuts in the learning process. Through a good instructor you get to learn from the mistakes that others have made and avoid them completely. But please don’t think that I am in favor of government mandated training. The government will just screw that up like they screw up everything else. Gunsite is simply the place to go. Gunsite was founded by Col. Jeff Cooper back in the 70’s. It is the oldest defensive training school for defensive shooters and, in my opinion and that of others, it is absolutely the best. 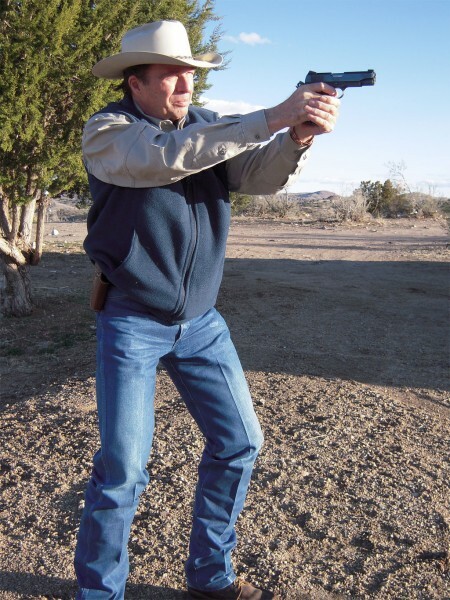 Gunsite’s basic pistol class, the #250, is a week long and that week is worth several years of trying to figure stuff out on your own. Buz Mills, the current owner of Gunsite, is dedicated to keeping alive the tradition and training knowledge that Col. Cooper started. In addition, he maintains a friendly, helpful, and safe, environment where folks can learn useful, life-saving defensive skills. Other schools may teach you how to shoot. Gunsite teaches you how to fight and how to save lives. One of the complaints that I hear from some readers is that such training is expensive. Maybe so. And maybe you get what you pay for. Before you whine too much about cost, sit down and tally up all of the guns, gear, and shooting paraphernalia, that you bought last year. For a fraction of that cost, you could afford a class at Gunsite. And then you would actually know how to effectively handle the guns that you own. Once we learn how to do something, we need to learn how to do it better. You would be amazed at the number of retired lawmen and soldiers who are still taking classes at Gunsite. And I am one of them. Knowing what Gunsite has been able to teach me makes me wonder how I survived through some 30 years of packing a badge. Lucky, I guess. But I would rather bank on skill than luck. And Gunsite will give you that skill, that mindset, and that confidence, that is needed to protect yourself and your family. Does this sound like a ringing endorsement for Gunsite? I sincerely hope so. This entry was posted in Personal Defense, Training and tagged col. jeff cooper, combat mindset, gunsite, home defense, illing new. Bookmark the permalink. Gunsite is worth every penny. I spent money on airfare, motel accommodations, the cost of the course and I would do it again. They taught me more than I ever could have learned alone. My trainers and my classmates rocked. From a supporter of Jeff Cooper and Gunsite,amen sheriff Wilson. Training is a must for anyone owns a firearm or wants to own a firearm. It is imperative to learn and understand the laws and safety guidelines for handling a firearm.